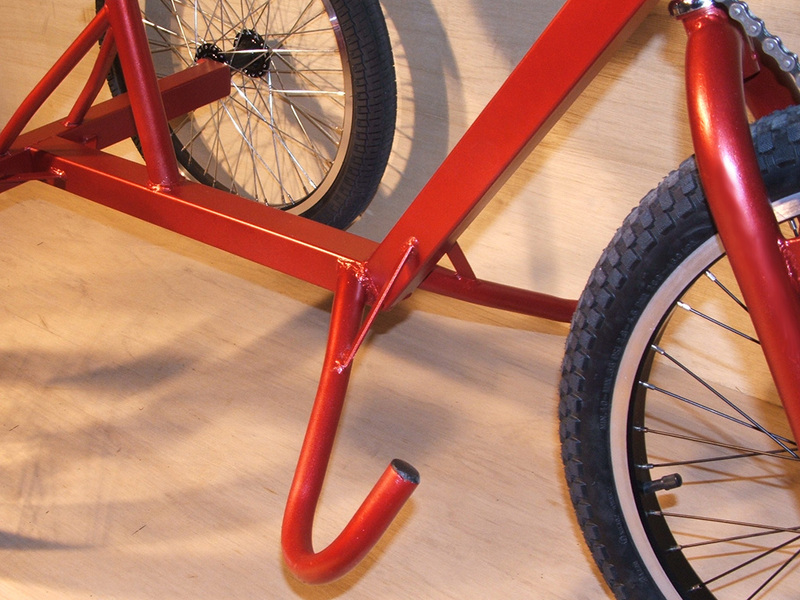 Build a Durable Hand Powered BMX Bike. The Atomic Zombie UCan2 freestyle BMX handcycle is an indestructible yet lightweight hand powered BMX style trike that will take any abuse your young riders can throw at it. This DIY handcycle is very easy to operate and includes a back pedal brake in the ergonomic and effective hand crank system. Styled after a freestyle BMX, the UCan2 handcycle looks cool, rather than looking like a special needs trike. 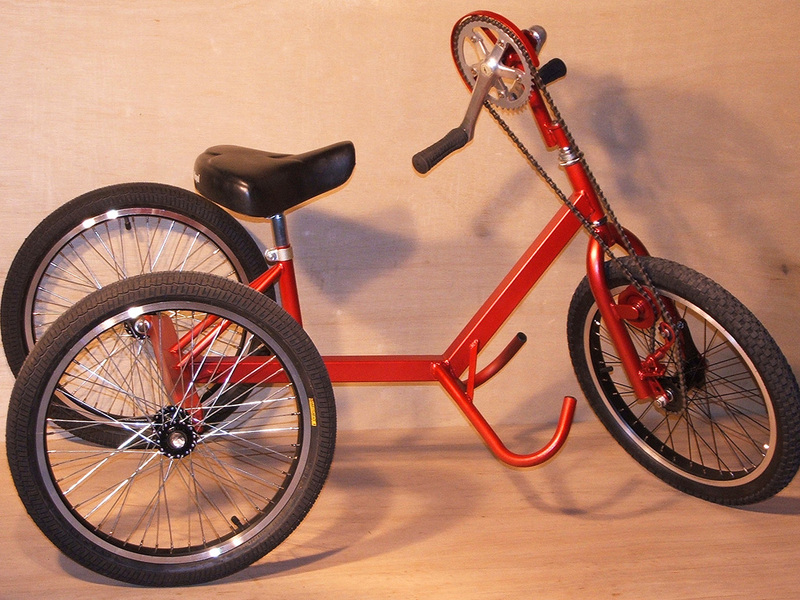 Using extremely durable 20 inch BMX wheels, this hand powered trike will be virtually indestructible. With a capacity of over 400 pounds, you can take your handcycle on or off the road, and it will handle anything you can throw at it. Our DIY handcycle uses 20 inch BMX wheels with 48 spokes, so it can take the punishment of a skate park, even with a passenger standing on the rear. The robust and lightweight square tube frame allows a person to easily lift the bike for loading into the back of a truck. The square tube frame easy easy to cut and weld, so even a first time builder will be able to create a great looking DIY handcycle. 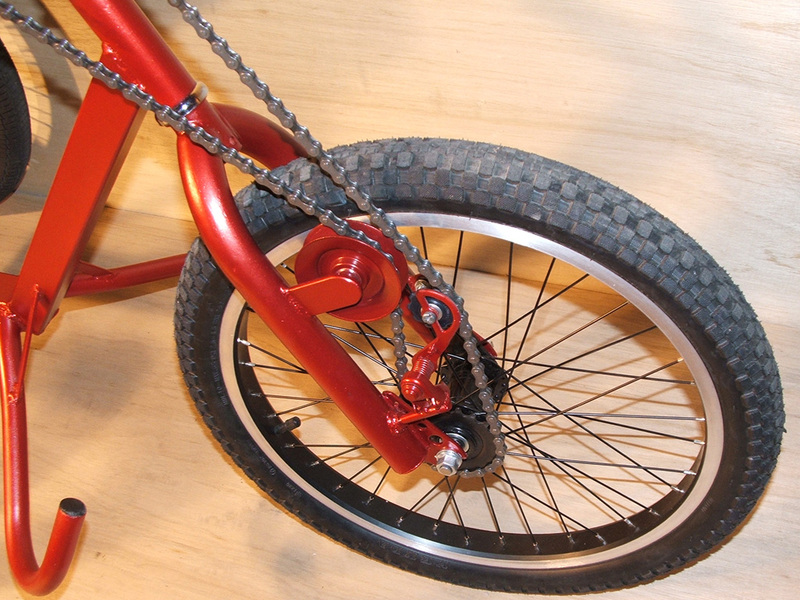 You can salvage the steering components from an old BMX bike or purchase new parts from any bike shop. Drive and Brake Operated Only By hand. Our simple-to-build steering system offers a full range of turning and incorporates the brakes into the same hand powered crank that drives the trike forward. Stopping is accomplished by turning the hand crank in the opposite direction to activate the smooth running coaster brake system. The hand grips use the same bearings found in standard bicycle pedals, so they are extremely low friction and easy to hold. All of the transmission and braking systems are placed in the front as a self contained unit. Braking is achieved by pedaling in reverse, the harder you press, the more the brakes are applied. Riding this hand powered trike is as easy as riding a refular bicycle. Exercise Your Upper Body on This HandCycle. Crank it down the street and keep up with the gang, or try your skill at the skate park. The UCan2 can maneuver around obstacles, and the handcycle will last for many years, needing very little maintenance. Every part of the smooth running front wheel drive transmission is made using only standard bicycle components. Anyone can build this on a limited budget. You can adjust the cranks so both hand pedals are inline as shown here or place them apart like they are on a regular foot pedaled bicycle. Both configurations work well, and it is easy to adjust to inline or offset pedals by removing only a single nut on the crank axle. Easy to Build on a Budget, and Easy to Ride. 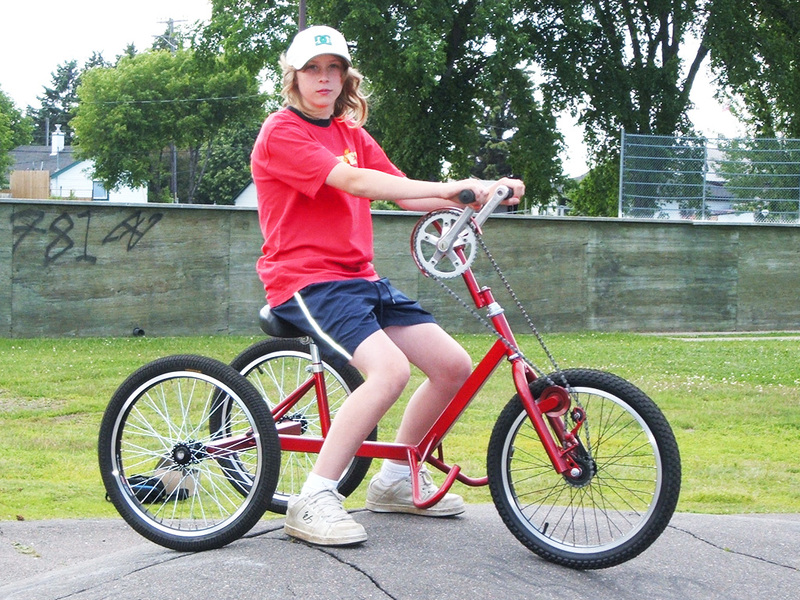 Our easy-to-follow hand powered trike plan uses only the most basic parts and tools to create a unique handcycle that looks as cool as any BMX two wheeler. 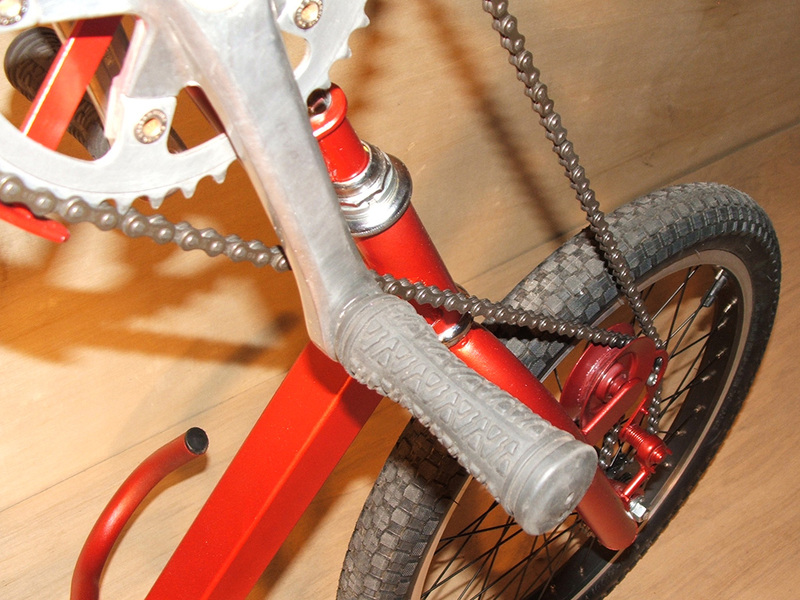 The chain is routed over the front forks using a standard hardware store pulley, and the idler is made from an old road bike derailleur. The transmission system is very smooth and it is impossible to derail the chain, so this DIY handycle can be ridden hard. Easy to Hold Hand Pedals With Smooth Bearings. The hand pedals are made from standard bicycle pedals, so they include a smooth running ball bearing for optimal power transfer. The DIY hand pedals are also easy to adapt for straps so you can adjust the handcycle to your rider's requirements easily. The Seat and crank position is easily adjustable for riders of varying sizes, and you can also build with smaller or larger wheels. The seat support utilizes a standard bicycle seat post tube, so a standard bicycle seat can be used. The seat can be adjusted up and down just like a regular bike, and you can easily add a much larger seat for riders that may require some extra support. Smooth Running Front Wheel Drive Power. The rear of the handcycle has plenty of room for a cargo box to carry your gear, school bag, or even pick up some groceries. 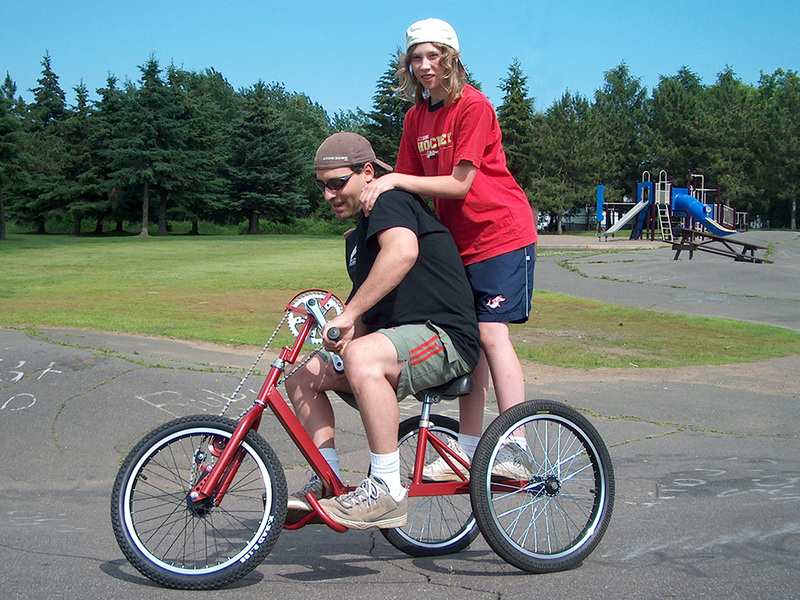 This hand powered DIY trike can carry hundreds of pounds, so riders of any size can enjoy a great upper body workout. The frame is tough enough for the skate park or for offroad riding, so you can go just about anyplace that a regular bicycle can go. The foot support system is designed to allow feet to be held in place using belts or straps. You can easily modify the foot supports to suit your riders requirements. 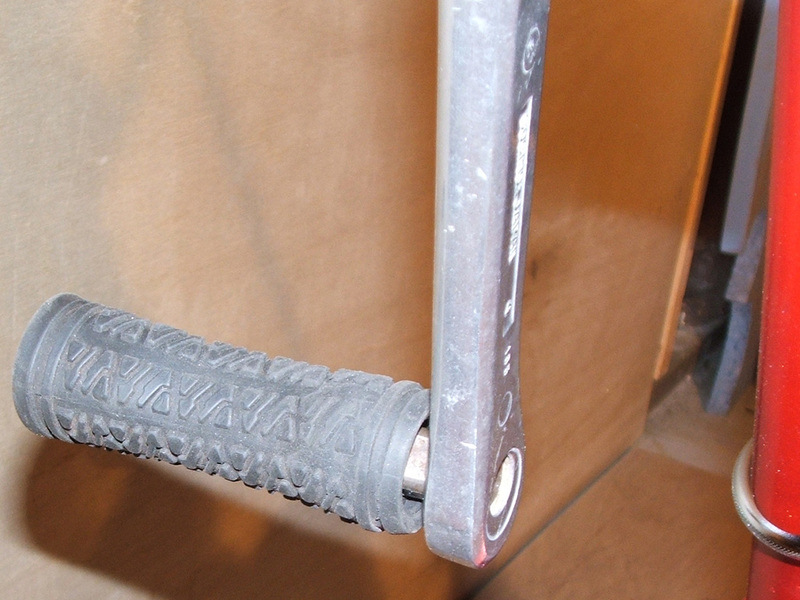 The drive system also includes a chain guard to keep loose clothes out of the chain. 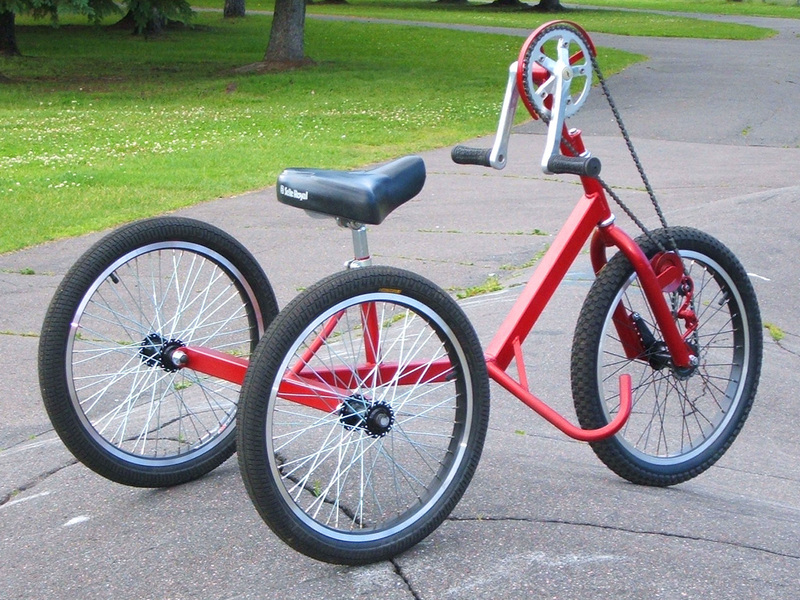 Work Your Upper Body On This Fun BMX Trike. Give your arms a great workout on a cool-looking and lightweight handcycle that you can build from our plans. This handcycle is just as capable as its two wheeled counterpart, but it can certainly carry a lot more weight. Extra passenger... no problem! For less than the cost of a typical kids bike, you can build this durable DIY hand powered BMX in a few days and put your arms to work. Carrying one or more passengers is no problem at all for this sturdy DIY handcycle, so you can give your buddies a ride to the park or tow them using a rope on their skateboards. Atomic Zombie’s easy-to-build DIY handcycle is as good on the road as it is off the road, so there is no terrain that cannot be conquered by hand power.